I’m fairly certain that in 2015, an overwhelming majority of the people reading this know about Enslaved and have formed an opinion on their careers to this point. I suppose there are going to be some people reading this who fall into the category of ‘In Times’ being their first Enslaved album; but I’d have to imagine there aren’t many. With that in mind; the best way for you to evaluate my, or anyone’s opinion on a new Enslaved album is to give you a bit of context on how we view their career on the whole. I’ll try to keep this from being over-indulgent, but Enslaved is as close as I have to a favourite band and is certainly a band that deserves better than a “what’s it sound like?” style review. I was hooked on Enslaved from the first time I heard them on a Blackened compilation around 1998 or so. The song was “Hordalendingen” from their 1997 album ‘Eld’. I bought ‘Eld’ as soon as I could and have followed the band ever since. While I wasn’t in on the ground floor, I was there from an early, formative stage, and for the bulk of their journey as a band. They were very active in the late 90s through the early 2000s, releasing six albums in eight years, and in the process becoming a very different band. Those changes were no more drastic from album-to-album than from 1998’s ‘Blodhemn’ to 2000’s ‘Mardraum: Beyond the Within’ with the latter album representing Enslaved at their most wild and free. Roy Kronheim was an absolute maniac on that album with his guitar work leading the charge as Enslaved destroyed boundaries left and right, and blazing new trails in the process. To be honest, I didn’t quite get it at first, but over time I grew into it, and it became my favourite Enslaved album. It would be unfair to expect a band to have more than one peak at that level as so few ever have it at all. Over the years, Enslaved continued to play within their much broader musical sandbox, trying new things here and there (prog-inspired keyboards on ‘Below the Lights’, approaching Pink Floyd worship on ‘Vertebrae’) but overall they had settled into their own unique blend of black metal and prog. 2012’s ‘RIITIIR’ largely falls into place, but the balance shifted too far into the prog territory for my liking, which lead an Enslaved album feeling flat and uninspired for the first time in the fifteen years I’d been listening to them, and including their pre-’Eld’ discography in retrospect; the first time ever. Following ‘RIITIIR’, I found myself feeling unsure or even anxious about what a new Enslaved album might sound like when I first read the announcement of ‘In Times’. It obviously wasn’t at the level of a Celtic Frost fan being nervous after ‘Cold Lake’, because ‘RIITIIR’ was a misstep, not an absolute disaster. It should also be said that the album prior to ‘RIITIIR’, ‘Axioma Ethica Odini’ was their best album since ‘Below the Lights’, so that also helped take the edge off of it to some extent. Finally, early February saw our first taste of the new album. Nuclear Blast released a lyric video for the album’s lead-off song, “Thurisaz Dreaming”, and my concerns were quickly scorned, beaten and left for dead. The song explodes out of the gate with the purest black metal riff the band has put together in years. Its right out of the ‘Eld/’Frost’’ playbook style-wise, and it’s a thing of absolute beauty. For comparison, it isn’t a fleeting moment like the opening riff from “The Beacon”, but it’s also worlds better than “New Dawn” which provided one of the rare, truly black metal-leaning moments of 2008’s ‘Vertebrae’. Nearly ninety seconds in, the song finally relents and transitions into a much more reserved and floating middle section, but no less powerful or compelling. While the music travels along these dreamier themes, Herbrand Larsen puts in some of his strongest vocal work to date. He’s always been very good, but he’s much more comfortable and natural, along with making better melodic choices. The song hits another apex just over halfway through, when things take a turn into some slightly surprising territory. The drums swing and bounce in a style that should sound familiar to anyone who has heard short-lived Norwegian supergroup Storm’s classic ‘Nordavind’. Chanting vocals swell and drone in the background while the guitars put forth a semi-folk metal vibe. Somehow, with everything going on, Larsen’s lead vocals manage to glide above the towering musical display. To say that “Thurisaz Dreaming” is an all-time Enslaved classic would be accurate and well-earned. That doesn’t mean the album peaked early, though; there is still the matter of “One Thousand Years of Rain” to discuss. The first time I heard the main verse, I damn-near wept for the joy I felt that Enslaved were back at this level. Anytime Enslaved works with thrashier tempos and drum beats; it usually means you’re in for some of their best material. “Urtical Gods” from ‘Blodhemn’, “Daudningekvida” from ‘Mardraum’, and more recently “Alu Misyrki” from the ‘Sleeping Gods’ all spring to mind as great Enslaved songs in a similar vein. “One Thousand Years of Rain” is right up there, though it’s much more melodic than any of those songs once the pace quickens. The chorus is exceedingly memorable for being what I have only been able to describe as “Enslaved plus Strawberry Alarm Clock”, which might sounds horrifying reading it back, but sounds great in execution. 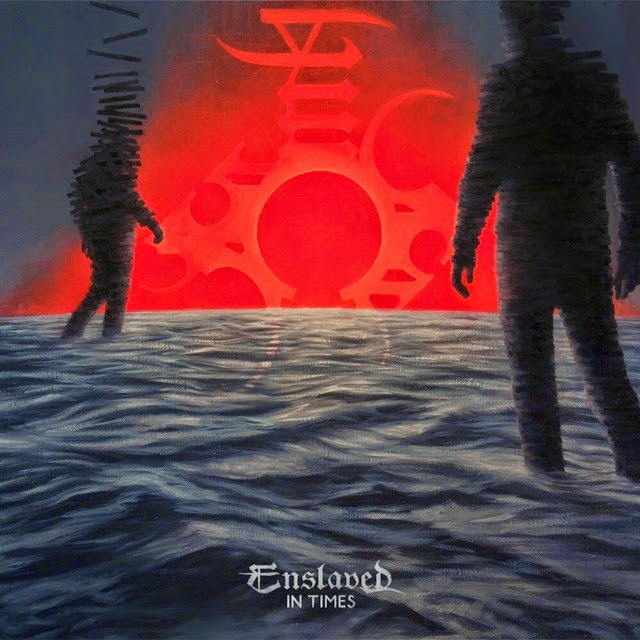 On this song too, Enslaved dabbles in a form of folk metal as the song breaks into group vocals, along with guitar parts that would feel at home on an Otyg album. They’ve toyed with elements like these in small doses before (see “Havenless” from ‘Below the Lights’), but this is the best-conceived version of it, and something I hope they’ll do even more on future albums. Future albums, I’m elated to say, are something I’m once again looking forward to. As unsavory as it is to contemplate, twenty-plus years together means that any Enslaved album could be the last Enslaved album. People change and want to try new things, so it’s at least a genuine possibility after such a long career. My point in bringing this up is that if they were to call it quits tomorrow; they would be ending things on a high note. It might be early to be thinking about a eulogy for the band’s career, but I would have to imagine they’ve got more years behind them than in front. Still, as I’m writing this, Enslaved are going strong, and sounding as good as they have in fifteen years. Everyone has “their” Enslaved album and that runs a wide spectrum of possibilities because Enslaved have been excellent in a number of different ways. ‘In Times’ is just another example of Enslaved finding a new energy and turning that energy into something beautiful. In retrospect, I can’t believe I was worried at all. You can pick up a digital copy here and a CD/LP copy here.